This ring is very solidly made with nice heft. 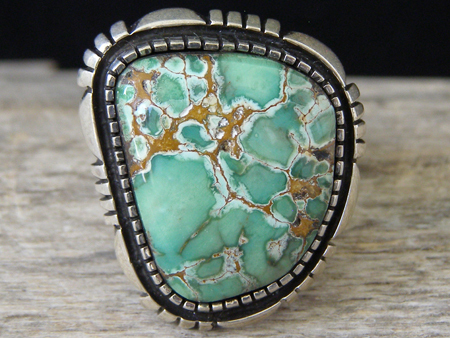 It is set with a free-form stone of natural, untreated Damele variscite from Nevada. This is a thick stone set in a handmade notched bezel. The beveled border of the ring is sculpted by saw and file work and a gap exists between this border and the stone so that the stone is actually set in a shadowbox. This is very well made with gorgeous design aspects and features a superbly cut and polished stone of natural Damele variscite. Hallmarked Herman V in script on the ring back and stamped Sterling inside the shank. Ring face: 1 3/16" x 1"